Recent release “A.K.A. Fred” from Page Publishing author Kenneth Frederick Ruhl is a truly heartwarming story about the first eighteen years of the author’s life as a young boy growing up in Oklahoma in a time when guns are used to provide food on the table and everyone is expected to work. Kenneth Frederick Ruhl, a former member in the military, residential sales consultant, and division supervisor who grew up during the years of the Great Depression, has completed his new book “A.K.A. 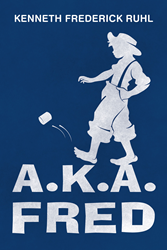 Fred”: a highly original story that covers his childhood when the Great Depression and World War II have affected everyone—including his family—and his memorable years with his friends. Published by New York City-based Page Publishing, Kenneth Frederick Ruhl’s relatable book will surely resonate to those generations belonging to the 1930s and 1940s, especially those who have experienced those years. This is a personal account full of details that touch every reader to empathize with people’s plight during these pressing times in the past. Readers who wish to experience this enlightening work can purchase “A.K.A. Fred” at bookstores everywhere, or online at the Apple iTunes store, Amazon, Google Play, Kobo or Barnes and Noble.